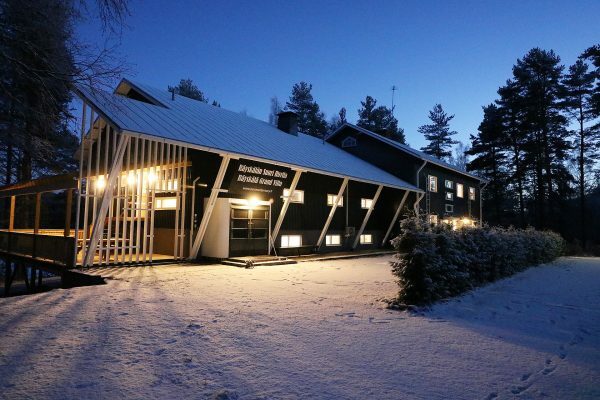 Räyskälä Grand Villa is an atmospheric multifunctional villa for small and large groups in the beautiful lake landscape of Loppi, 90 kilometres from Helsinki and 115 kilometres from Tampere. 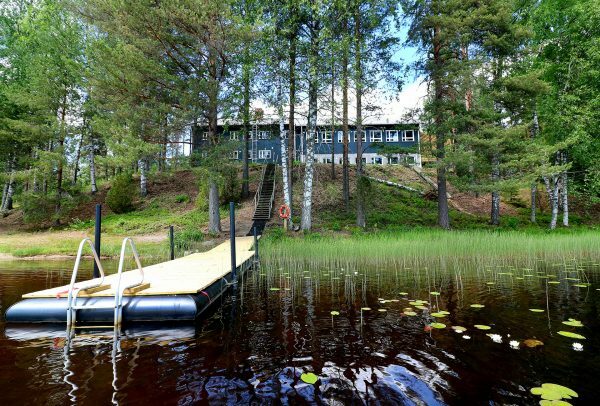 Up from a small hill the Grand Villa equipped with modern comforts offers a fine view on the lake Kaartjärvi with a private shoreline of 150 meters. View area illustration. 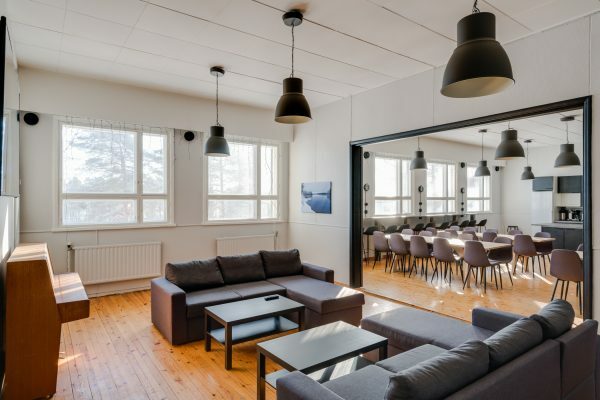 The Räyskälä Grand Villa houses more than 100 customers for daytime events and activities but is also well suited for more intimate accommodations and meetings for smaller groups. The Grand Villa offers a flexible alternative for many occasions including meetings and recreational events. We gladly serve companies as well as private customers with groups of many sizes. We rent the Grand Villa for one group at a time to ensure our customers Peace & Privacy. 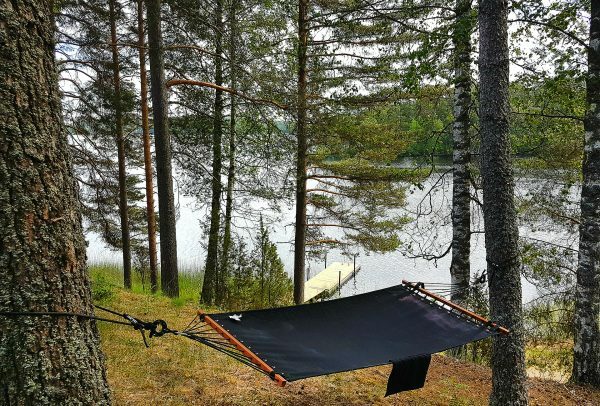 The western end of the villa is also possible to rent separately as Räyskälä Lake Apartment, when reserved 6 weeks (42 days) at earliest before arrival. The spacious facilities in the Grand Villa boldly express the industrial-style interior with the craftsmanship of the local carpenters. The multifunctional villa has around up to 60 bed places, 10 bed rooms and 3 saunas, a large wood-heated sauna and a smaller electric sauna. 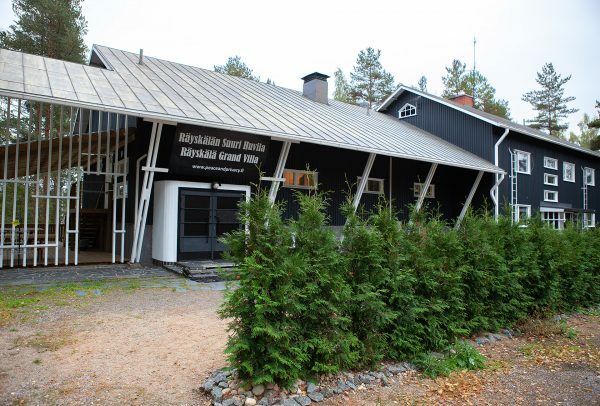 The third sauna is 50 m2 in size and has access to the lake and the dock via a 100m2 large scenery terrace. Räyskälä Grand Villa displays a gorgeous view over the lake Kaartjärvi from the main hall’s roomy scenery bar. The main hall is there to serve the customers as they please. And since cooking among friends is always fun, it has an open kitchen. The Grand Villa has a main kitchen as well that can be used for cooking by yourself but is also suited for catering. The 2 terraces grant a great view over the lake Kaartjärvi all the way to the far horizon. The 40 m2 terrace is 2 meters up from the ground and gives a higher viewpoint for admiring the scene. The 100 m2 terrace extends towards the lake and has plenty of space for up to 50 persons with table groups. 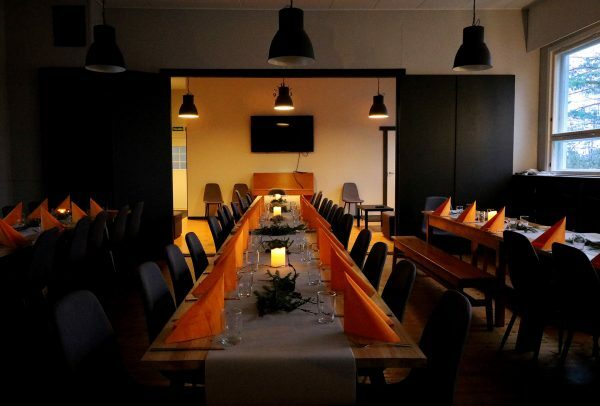 The Räyskälä Grand Villa also has a game hall with a pool table and table soccer for joyful game moments. View detailed floor plan. Main Hall, Kitchen and Lobby: The high 100 m2 main hall has an open kitchen and sits 80 customers around the catering tables and couches. The space can easily be rearranged or divided in to two separate areas with a sliding wall. Both sides have large flat screen TVs that can also be used as presentation screens. There is also a fast and free Wi-Fi. A 7-meter-long scenery bar is located along the lake side wall of the hall and offers a clear view over the lake Kaartjärvi. The sofa sets on the sides of the hall are great for socializing and relaxing after a meeting or dining session. The big corner sofas are also suited for sleeping. 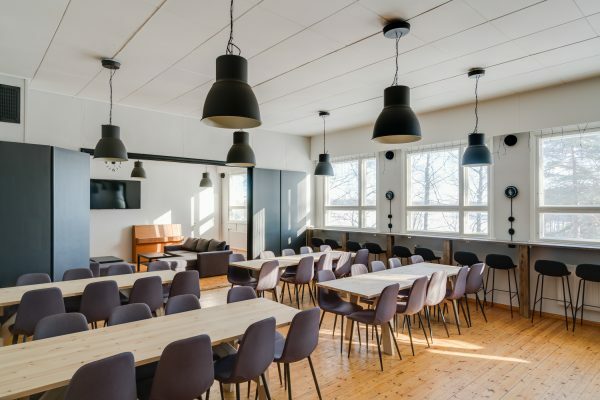 The main hall has direct access to the main terrace, first floor saunas and the lake enabling quick refreshing visits around the premises during or after meetings and dining. The separate lounge area offers another comfortable place for socializing although it works as a conference room just as well. The lounge also has a smart TV which can be used to watch TV or show presentations. Or you could simply plug in your gaming console for some fun! Accommodation: For those who wish to stay the night the Grand Villa is best suited for groups of 10-40 persons. There is a total of 35–40 bed places in 10 separate bedrooms, on convertible couches and extra beds. If need be, we also offer extra mattresses. Kitchens: The spacious open kitchen with an electric stove and oven, a large fridge, a freezer, a dishwasher, a microwave, Moccamasters, toasters, electric kettles and tableware for up to 60 persons enables food preparations also for large groups. Our customers are free to handle any catering or food preparations how they want, but we also offer full catering and preparation for extra price. The separate living kitchen is for our cooking-loving customers. The kitchen has the means to prepare food for very large occasions. We rent the kitchen for extra price. 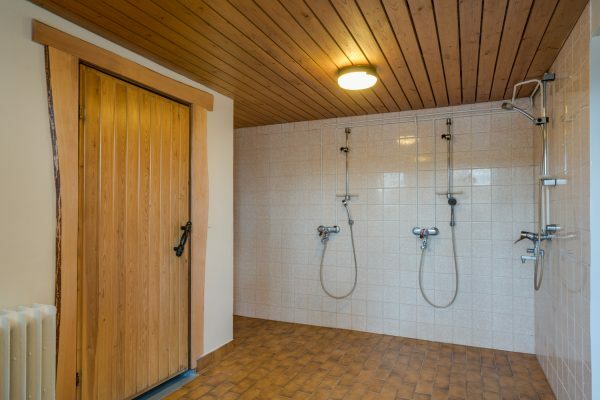 Saunas, Showers, Dressing Rooms, Bathrooms: There are 3 separate saunas in the Grand Villa. A large wood-heated sauna that sits easily 8–10 customers. There are 3 showers and the dressing room has plenty of room for 10 customers. A smaller electric sauna for 2–4 customers with a shower and dressing room. 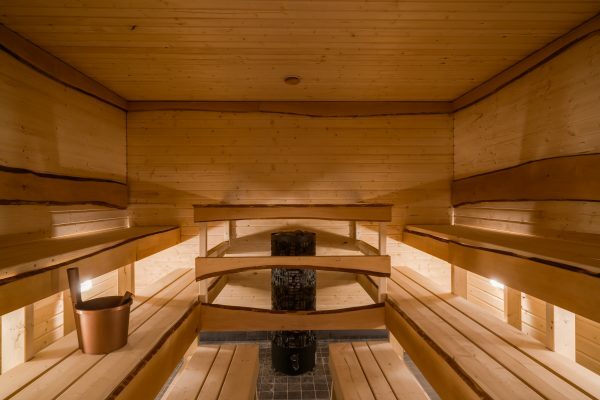 For large groups there is an even larger 50 m2 wood-heated sauna section that sits 10–14 customers. 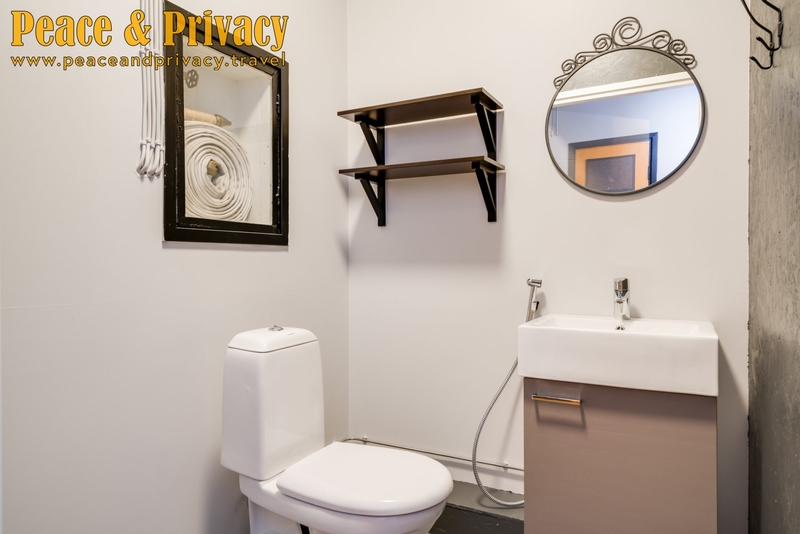 A large dressing room with showers, a toilet and a Jacuzzi! Altogether around 30 customers can use saunas simultaneously. 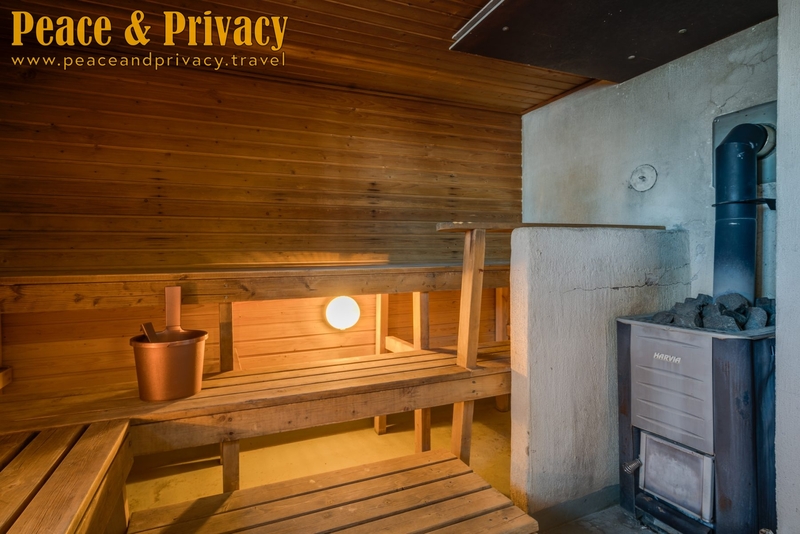 Each sauna has access to the huge 100 m2 terrace to enjoy the view or dip in to the lake. Naturally the terrace has also even 2 hot tubs which are in use all year-round, let it be +30 or -30 degrees! There are 6 separate bathrooms making morning routines fast. Hot Tubs: Traditional wood-heated hot tubs are located on the scenery terrace with the same beautiful view to the lake. Tubs are usable any time of the year and accessible comfortably via the terrace. In addition, an indoor Jacuzzi is located in the larger sauna’s shower room. There’s always a chance to relax in warm water no matter what time of year it is! Lobby and Game Rooms: The Grand Villa’s separate lobby is well suited for socializing or playing games. Have some quality time with your friends or spend your time with fun games such as table soccer and pool. It’s all up to you! 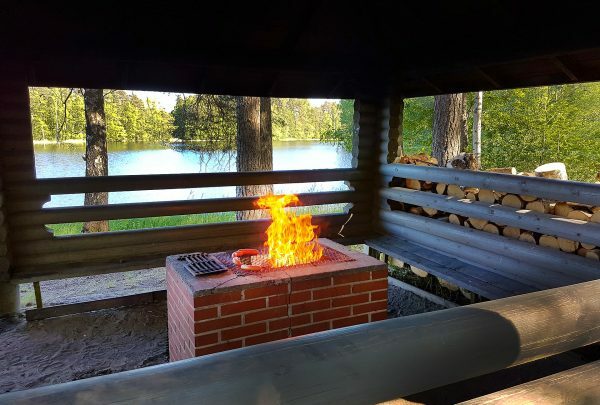 Barbeque Shelter: Down by the lake is an atmospheric log-built barbeques shelter with a sturdy brick fireplace. The shelter sits about 15 persons. In addition, there is a robust charcoal grill (we kindly ask to bring own charcoals for it). Hiking trail: Near the villa there is an outdoor route where you can take a small hike during low or non-snow season. A route map can be borrowed from the villa. The Poronpolku outdoor trail also runs close to the villa. Fishing, Boating and Paddling: The Grand Villa is located only 20 meters from the lake, which makes it easy to go fishing, boating or paddling in the peaceful lake. We also organize guided tours and rent equipment for customers who have rented the Grand Villa. During winter the lake is obviously used for ice skating, cross-country skiing and ice fishing. For a reasonable price, we can make a glade to the ice or create a surface for ice skating. We also gladly organize fishing lessons. Please ask for offers! Outdoor Games: During the meeting or party, you can also play football or volleyball at the Räyskälä Grand Villa playing fields! The price includes the multifunction villa and the use of the saunas. Additional services offer the use of the hot tubs, the final clean-up, towels and sheets with the bed made or sheets as a stack. We will gladly rent boats and canoes, offer food services through our catering service, and have saunas and hot tubs heated on our customers arrival. 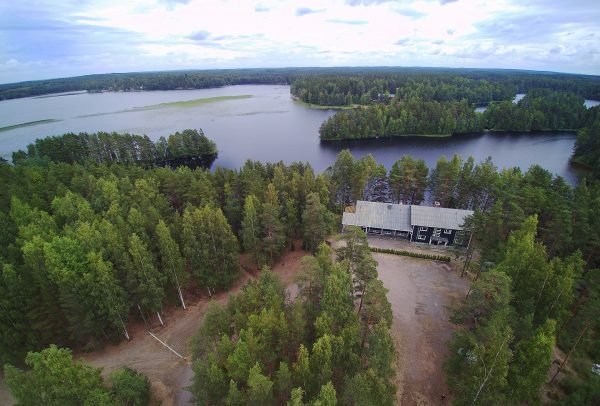 Ask for an offer for Räyskälä Grand Villa by filling the offer request or by contacting us via email info@peaceandprivacy.fi. View also 3D video tour of Räyskälä Grand Villa.